Uh oh, he’s on to us. Opposition to Frazier is all a part of the global plot to get the Carroll County Republican Central Committee to choose a socialist to fill Getty’s seat. How Kotmair explains Frazier’s spanking in the Republican primary in her bid for renomination to her seat on the commission is unclear. More left-wing fraud? Or is it pinko infiltration? Good news, JoAnn. It’s definitely you. (1) Although I wrote that “nobody puts crazy in the corner,” I had not realized that Frazier had ran a write-in campaign for County Commissioner against her own party’s nominee after losing the primary that garnered a whopping 9% of the vote. Makes her a doubly news of the weird choice by CCRCC. (2) One of the people who voted on the vacancy was an employee of outgoing Commissioner Frazier. (3) 2000 people have already signed an online petition against the appointment–more than voted for Frazier in the Republican primary–and they have gained support from one member of the Carroll County Commission. (4) Michael Stewart over at Red Maryland has inveighed against both the secret process (the vote and who was considered were secret) and the decision to appoint this person twice rejected by the voters at the polls. Republicans are livid over this travesty. (5) Frederick County Councilmember Kirby Delauter must be eternally grateful that Robin Frazier has distracted attention from his own stupidity and public humiliation. Gov. Martin O’Malley found a way out of having the follow through with a disastrous appointment by the Prince George’s County Democratic Central Committee. Let’s hope that Gov. Elect Larry Hogan can do the same. Question: Will this help inspire bipartisan support for reform of the appointment process? Former Carroll County Commissioner Robin Frazier made herself blogger bait when she decided to sing part of the 2014 State of the County address. Unfortunately, her oeuvre has been taken down from YouTube and now, I fear, lost to posterity. Carroll County Commissioner Robin Frazier opened a meeting of the Commission with a prayer invoking Jesus Christ despite a federal court order. She views the order as a wrongly issued violation of her First Amendment rights. Frazier is “willing to go to jail” and said that America will soon be “all the way to Communism if we don’t start standing up and saying no.” She lumped the anti-prayer ruling with plots to take away guns, palm scan her children, and take away property rights through Plan Maryland. As I mentioned at the time, her raving looney views (rather than her commitment to religion) and odd behavior placed her in electoral danger even in a Republican primary. Indeed, this former member of the Ehrlich administration lost the primary to Stephen Wantz by 56% to 38%–a sound thrashing for the incumbent. But nobody puts crazy in the corner. 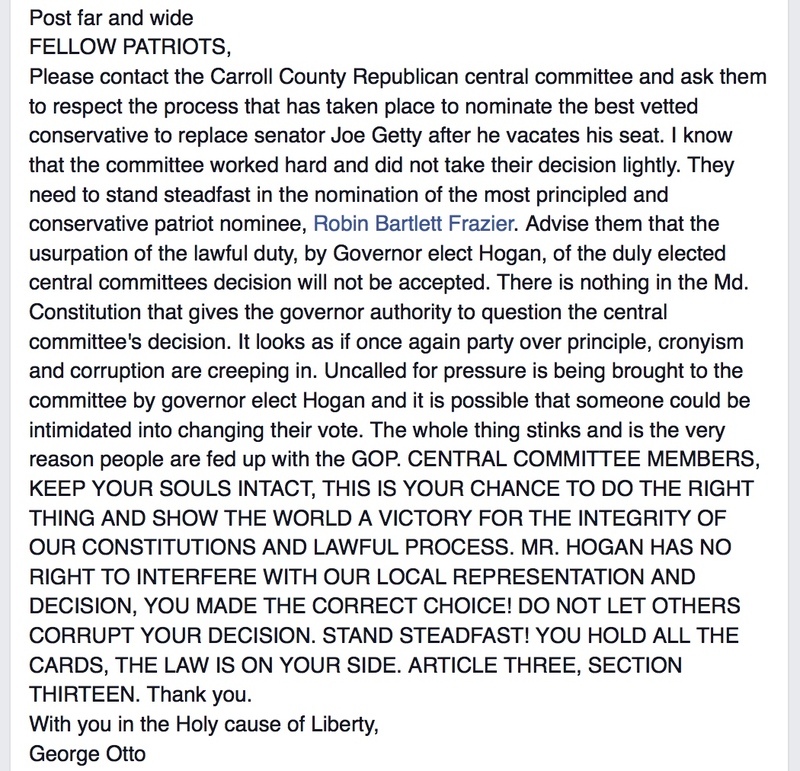 Highly regarded Sen. Joe Getty is giving up his Senate seat to work in the Hogan administration. According to Maryland’s process for filling General Assembly vacancies, the Carroll County Republican Central Committee chooses his replacement. And they’ve selected Frazier over Del. Justin Ready. Please tell me that only Carroll Republican Central Committee members think that an incumbent losing renomination after acting like a guest star on Law & Order or the latest Nancy Grace vehicle is grounds for promotion to a Maryland Senate seat. You can’t blame Carroll’s Republican voters–they tried and now they will be “represented” by Frazier in the General Assembly for the next four years.